Mitchell served as the program’s lead teacher while working closely with program director Sean Durham, Ph.D. 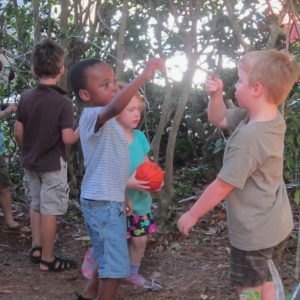 He acknowledged that such a “permission to play” model might not sound very academic to those unfamiliar with the profound learning that happens in the context of play, but he points to its necessity. The summer enrichment program has been held at Auburn University for 28 consecutive years. What never changes is the effort to develop lifelong learners and children who will grow into good citizens in our democracy. The first step in building a play curriculum, is to design a rich, stimulating environment. The program is housed in a series of connected classrooms in the Haley Center and included many traditional classroom elements for the children to explore. In addition to books, blocks and dramatic play, this year there was a large art studio set up with paint, clay, wire, markers, paper, and recycled materials to encourage children to creatively explore concepts and designs. Many children used the art of famous artists and book illustrators as models for their work. The sand and water station served as a place where children observed scientific concepts such as compounds, gravity, movement, and force. Play in this area led to applications about how water is used to make electricity and water’s force that is observed in the weather. Beyond the academic applications, the program let the power of the environment influence children’s abilities to develop emotional regulation and other executive function skills. Neutral colors and natural, soft lighting complemented the furnishings and created what Mitchell called “a calm and inspired learning space, ready to support whatever the children imagined.” This rich learning environment has been enhanced recently through the generosity of PowerTech America, which is part of the area’s Hyundai-Kia family of industries. 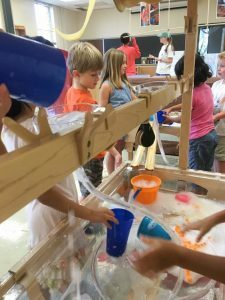 PowerTech’s $40,000 gift allowed the program to purchase high-end sand and water tables, art easels and supplies, and many other tools that are necessities for high-quality early learning environments. One classroom featured several feet of low shelves containing hundreds of wooden blocks, which were also supported by the PowerTech gift. Early in the program, a few children thought that their block play related to playing with toy cars. They initiated building a road made of construction paper along the entire back side of the classroom. They exhibited planning skills, innovation in choosing materials to replicate a road, and designed street signs and nature backdrops to make their road representative of their real experiences with travel. This self-directed endeavor combined multiple important thinking skills and dispositions that have been recognized as important to modern learners. “While the types of materials set out and the physical environment are paramount, it is against this backdrop that we focus on an approach that emphasizes relationships to guide learning and behavior. Really, it all comes down to relationships,” Mitchell said. “It takes trust on the adult part to embrace this philosophy that knowledge is actively built through hands-on experiences in the context of relationships,” Mitchell said. “It can be scary to step back and let the children play because it makes the teacher look passive. Of course this couldn’t be further from the truth. The teacher is very active, preparing and constantly refining the environment, observing and meticulously documenting learning, interacting and providing very intentional experiences with the children, and collaborating with other adults to sift through and get as close as possible to real learning. The program served as a practicum lab setting for 19 preservice teachers, all undergraduates in their junior year of Early Childhood Education. It was their second semester and their first full-time teaching experience with children in a professional setting where they were supported academically. For many, a child-centered approach to education was a new idea. “The way many of the preservice teachers rose to the challenges of this work was impressive and inspiring,” Mitchell said. Mitchell, who has a Master’s in Family and Child Development from East Carolina University, is passionate about lab school settings and helping students build their understanding about teaching. 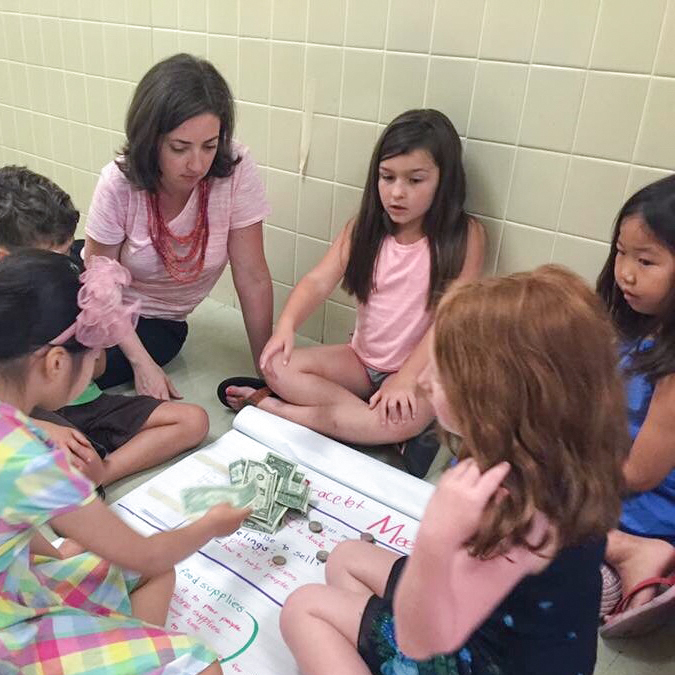 In the summer program, if a problem came up she might model the type of language or conflict resolution and ask the practicum teachers to observe.